Bonaire with Randy – 2 weeks – choose one or both! $100 per week discount if you stay both weeks. Bonaire is, IMHO, simply an incredible place to dive – for EVERYONE. It’s relatively easy to get to, with reasonable airfare generally available. It’s got some very easy, yet incredibly beautiful dive sites, giving new divers an excellent chance to gain a LOT of bottom time and experience. It’s got some more challenging sites for more experienced divers. It’s got great infrastructure (read excellent first-responder services and an excellent grocery store…!) The people are friendly, and it’s located below the hurricane belt, so the constantly sunny, never too-hot climate is almost boring. Gypsy Divers has been visiting Bonaire since before there was a Gypsy Divers. Margie and I took one of our first groups there in 1982. And this is Randy’s 5th year of leading tours to Bonaire – so we want to make our two consecutive Bonaire weeks in 2019 a special Gypsy celebration of a wonderful island that has provided us with close to 40 years of most excellent diving adventures. Randy will be offering a lot of specialty training on this trip, and also just a lot of totally fun reef diving – your choice. We are holding several room categories, with different rates per room choice. The posted $1195 rate is for 4 divers in a 2-BR unit. If you and your buddy are divers and want a 1-BR unit, the price goes up to $1395pp. We’ve also got some 3-BR units for 6 divers, where the rate drops to $1095 per diver. And for those of you who would like to go, but don’t have a buddy – unfortunately, we will have to charge you a single person supplement unless we can find someone willing to share a room with you. The single supplement will vary, depending on the room category, but generally runs between $400 and $600, depending. If you’d prefer a room by your self, no problem. But if you’d prefer a room-mate to make the trip more affordable, we’ll do our best to help you find one. We just can’t guarantee it. But the sooner you let us know you’d like to go if we can find a room-mate for you, the better our chances. 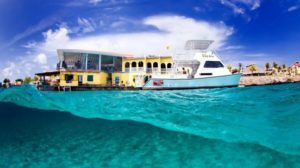 With as many as 60 officially listed dive sites on Bonaire and another 20 dive sites on Klein Bonaire, the dive operation at Buddy Dive Resort is geared up for you to make the most out of your dive vacation. Bonaire’s sea abounds with beautiful marine life and a fascinating variety of multi-colored tropical fish. The sea is remarkably calm and conditions are superb for both scuba diving and snorkeling. I truly expect this 2-week experience to sell out pretty quickly. We REALLY hope you’ll join us on at least one of the weeks. If you have any questions or concerns that you think I can help you with, don’t hesitate to drop me an email. Trip price does NOT include airfare, marine park fee, vehicle insurance, or departure tax. Trip price is based on quad occupancy in 2-bedroom condo units with full kitchens. And if you’d prefer, we do have other accommodations / rates available. Just call to tell us what you’re looking for. Trip price is subject to change without notice, but full payment guarantees the price. $300 non-refundable deposit holds your spot. Final money due May 1, 2019. Because of the non-refundable nature of our group trips and the fact that all adventures carry some risk, we STRONGLY recommend trip and diving medical insurance. Gypsy Divers RECOMMENDS either DiveAssure or DAN.